Charles and I began our search for a kitten in the summer of 1995. We had been to the Peel Humane Society but were not quite sure if we were ready to make the commitment of having a pet. By chance, we came across a pet store in Meadowvale. There were several kittens in a cage, all meowing and falling over one another. Our eyes went to one in particular, a white tabby with multi coloured markings. It was love at first sight, and we knew that we had found our perfect pet. We had already decided on the name Samantha,and after paying the $39.00 for this tiny ball of fur, and purchasing the necessities, we began our trip home. Samantha was not content to sit quietly on my lap (we had no carrier for her,) and struggled to free herself. On arriving home, food, water bowls, and litter box were put in place, but this tiny eight week old kitten was on a mission; to explore the entire house. Our townhouse had a small patio, and Samantha would sit for hours at the sliding doors longing to get out. When she was about six months old, and had been spayed, we decided to let her out onto the patio. 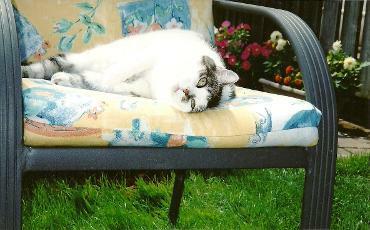 Samantha was an indoor cat, but with a harness and leash, she had the experience of being outdoors, which she loved. She was content to lie in the sun, with one of us keeping a close watch on her. Samantha's favourite game as a kitten was ''go hide.'' Her scratching post was in the basement, and Charlie would tell her to go hide. She would run and hide behind the scratching post, and peek out from behind. When he threw a small ball, she would come out from behind the post, chase the ball, and the game would start over again. Because we were living in Mississauga, and I was working in Toronto, my time with Samantha was limited due to travelling time. I adored her, but had not had the opportunity to bond with her the way that I'd hoped. When she was three years old, we moved to a small bungalow in Etobicoke. The house had a large yard, and by the second week, Samantha was ready to check out her new backyard. I was off for the summer, and we would spend hours outside. She would lie in the walkway, or on her favourite garden chair, sunning herself, surrounded by several varieties of flowers that made up our garden. She had become the center of our world, and thankfully, she knew it!! Samantha had developed arthritis at an early age, and was beginning to slow down. She still loved the outdoors, but would spend hours looking out the dining room window. She slept on her favourite dining room chair, hidden from view by the tablecloth. On occasion, she would jump up on the bed and go to sleep, but usually preferred her privacy. Samantha and Charlie had a very special bond. When she had her teeth cleaned, he went to pick her up after work. The girls said that she'd been hissing much of the day, but as soon as she saw him, the hissing stopped, and she settled happily into his arms. He retired when Samantha was twelve, and they would have their breakfast on the patio. We had a large carport, and whenever there was a storm, he and Samantha would sit in their respective chairs, enjoying what was sometimes quite wild weather. When Samantha was sixteen, tests revealed that she was in the early stages of kidney disease. A change in her diet stabilized the condition for a short time. We moved to St. Catharines when Samantha was seventeen. By then, her kidneys were starting to shut down. Late one Saturday evening, she suffered a stroke. In a panic, we took her to the emergency clinic, where she was kept for observation. On our arrival at the clinic early Sunday morning, Samantha was brought in to an examination room and laid gently on the table. She was wrapped in a soft blanket, having been given a warm bath. We were told to take as much time as we needed to say our final good-byes.. As we told her how much we loved her, stroked her soft fur, and tried unsuccessfully to hold back the tears, she kept her eyes on us. She was hearing our voices, and, I know now, asking us to let her go. 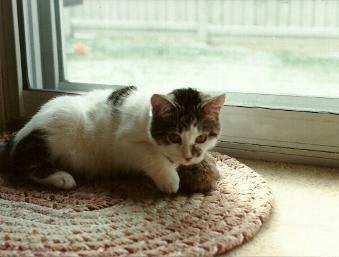 She left us peacefully on November 18th, 2012, after giving us seventeen wonderful years of love and happiness. As we were driving home, we were both filled with a pain and sadness like no other that we had ever experienced. We were going home to an empty house; the void was unbearable. Over the next couple of days I was able to reach out to her, telling her over and over how much we loved and missed her. I needed to have the time to grieve before being able to accept that she was really gone. Samantha taught me that love is shown in many different ways. Because she was not overly affectionate, and really, a loner by choice, her love for us was all the more special. She trusted us, and felt safe in her environment. This was Samantha's way of showing love; her acceptance of us. Memories of Samantha are displayed in a beautiful memory frame and a memory box. As time goes by, I find myself thinking of her with sadness that she is no longer with us, but also a feeling of peace knowing that she loved us very much in her own special way. She was our angel, and is watching over us. We love you baby girl.